Similar to Google Analytics, we’ve now enabled the user to compare the organic traffic data between two periods. Many of our clients have requested this throughout the time and we’re happy to finally release it today. We’re now overlapping the CTR trend with the organic traffic and adding relevant annotations. This will easily help correlate the impact that a rank fluctuation or a change of the landing page/title/description had on the CTR. Thanks, Christian from Planday.com, for the insightful idea. There are keywords like “restaurants near me” which have high search volumes, but the results are highly customized. As we only track one location, this could significantly affect the reliability of the forecasts. 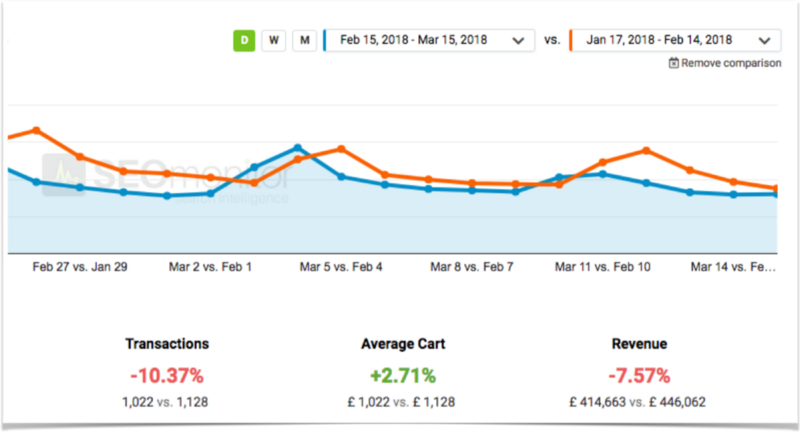 With this update, we’d automatically identify and highlight them, as well as only taking a fraction of their total search volume into consideration in the forecasts.